Forget Getting into Shape, Let's Get Your Career into Shape - Staffing Solutions, Inc.
For the next few weeks, we will be doing a series on how to tweak your resume, ask for help, and successfully navigate the steps on your journey to your next role. There isn’t a day at Staffing Solutions when I come across a candidate whose resume doesn’t need revisions. No matter if you’re representing yourself, or are taking advantage of an agency to help represent you, your resume is the only ticket you have to get past the “gatekeepers” and onto the desk of a hiring manager. Let’s tackle the easy part first: formatting. There’s no need to overcomplicate things. Take out any logos, images, shading, symbols, etc. When it comes to font, this is not the time to show off your “fun” side. Stick to the basics, and use a normal font like Arial, Courier, or Times New Roman in 11-12 points. Remember that hiring managers are looking for the meat and potatoes — your experience! Why such simple formatting? Many companies rely on ATS (Applicant Tracking Systems) to review resumes for keywords before a recruiter reads them. 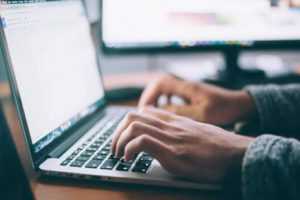 If your resume is complicated and includes graphics or a crazy font, it will be more difficult for the system to read the resume and process the information. In addition, the “gatekeepers” who read resumes typically spend about 6-7 seconds glancing at them before making a decision. Make their decision easier by being clear and concise! 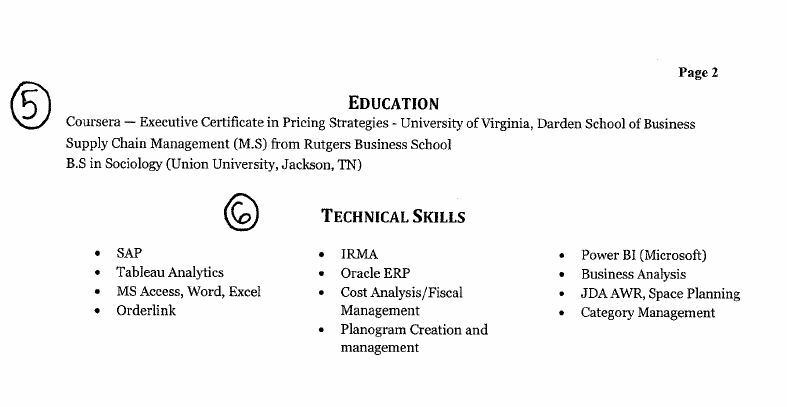 This is our suggested format for a quality resume. 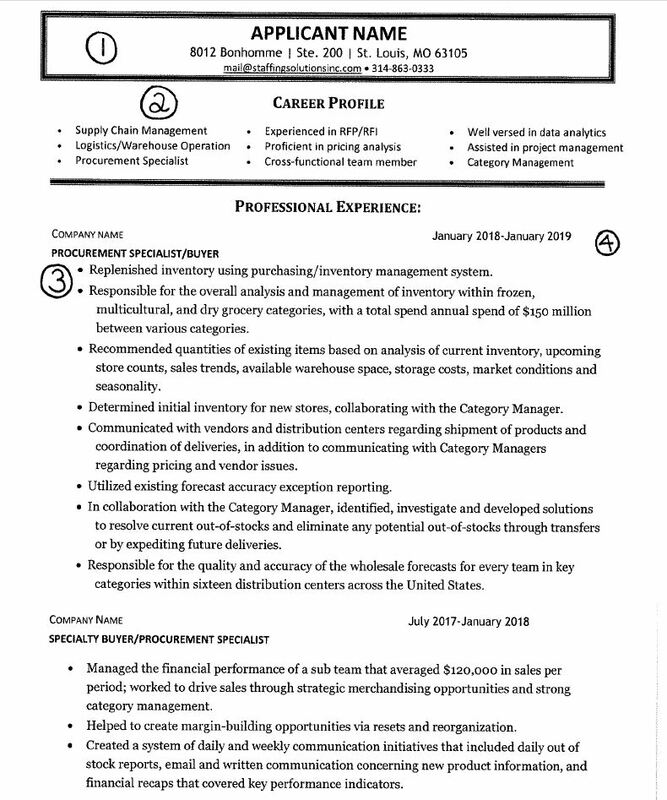 Follow along with the numbers on the resume and learn a few tricks! Name – Clearly state your name, address, and other contact information such as email address and phone number at the top. Career Profile – This is a great place to highlight your strongest qualities before diving into your experience. The bullets draw the eye to this location, making it a great place to showcase your skills. Remember this is your career profile, not a place for your technical skills. That will come later! Professional Experience – First, list the company name followed by your position underneath. If the company isn’t well known, write a short blurb explaining what they do so we have some context. Underneath, list your duties and responsibilities. We’ll talk about customizing and tweaking these in our next blog. Dates – Put the dates at previous companies on the right side of the resume across from the company name, as it’s much more legible and clear to follow. Education – It’s important to list any degrees or certifications that you have here, as you might be more qualified for a position than you initially think. Be wary about putting dates, as that might “date” you and distract the recruiter from your experience. Technical Skills – Many positions require you to be proficient in some type of program or software, and here is the place to brag about it! Once again, the bullet points draw attention to this area, so it’s a great opportunity to list your skills. While the format of your resume is extremely important in getting past the “gatekeepers,” the customization aspect of your resume is what will get your resume onto the desk of the right person! Next week we will share with you some great tips on showcasing your past experiences to align with the role you’re applying for. Oh, and one more tip… Never put your picture on your resume — unless you’re a real estate agent!